One of the newest saints of the Catholic Church, this man holds a special place in my heart. My husband and I received a personal blessing upon our marriage from him while visiting Rome on our honeymoon. Studying his writings while in graduate school helped me encounter Christ in a deeper way, and fundamentally changed how I understand my vocation. In short, he helped me fall in love with beauty and mystery. This is imperative to my work as an artist. 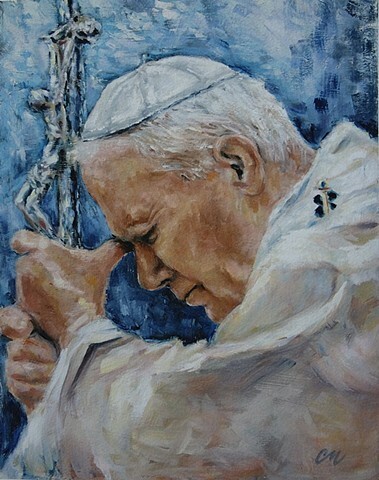 In this painting, I tried to convey John Paul II's deeply prayerful and contemplative side, while using vibrant colors and brushstrokes to represent his joyful spirit. In a process known as "giclee", this fine art print is on museum quality, archival paper that will never fade or yellow. Each print is inspected, signed, and numbered. The edition is limited to 250. Shipping and handling for addresses within the continental United States is included in price.